It was built on a rocky promontory, a site also occupied by prehistoric man. In ancient times it was overshadowed by powerful neighbors, but when the city- states of Sidon began to decline in the first millennium B.C, Beirut acquired more influence. 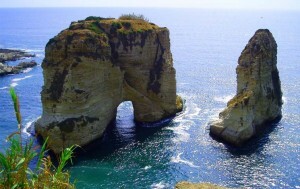 During Roman times, Beirut became a roman colony (15 B.C), and an important port and cultural centre. During the roman and Byzantine eras it was distinguished for its law school, whom professors helped draft the famous Justinian code. Beirut was destroyed by a devastating earthquake in 551 A.D. A century later, it was conquered by the Muslim Arabs and in 1109 it fell to the crusaders. The city remained in crusader hands until 1291, when it was taken by the Mamluks. In 1516 the 400- year ottoman rule began. Later, in the 17th century, Beirut knew a period of great prosperity under the government of emir Fakhreddine II. Then with the break –up of the Ottoman Empire at the end of the World War I, the city became the capital of modern Lebanon.